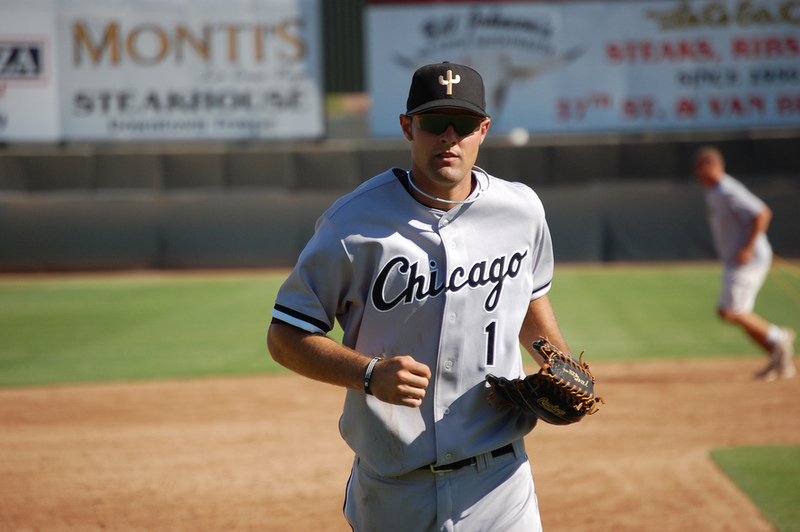 Hey everyone, my name is Jordan Danks and I am a 22 year old outfielder in the White Sox organization. You may be wondering why my last name sounds so familiar, that is because if you are a Sox fan you have probably heard of my older brother John Danks who just spent his second full season in the big leagues for the sox. I like to believe that I’ve been with the Sox longer than he has though because I was actually drafted out of high school by them in the 19th round in 2005. However, I elected to attend the University of Texas and play for Augie Garrido. After three years as a Longhorn I was lucky enough to play in the same organization as my brother. I signed in late August and was immediately shipped out to Kannapolis North Carolina to play for the Intimidators (class low-A) for the remaining 12 games of their season. When the season ended I had about two weeks off before attending the instructional league right here in Arizona. After spending a month in Arizona I was only home a week before discovering I would be returning for another month. Truth be told I was bummed at first because I had just gotten back home. Once I realized what a terrific opportunity this was though I became ecstatic. I have enjoyed my time here so far and met a lot of great guys. We have unbelievable team chemistry. It is really fun being able to play with guys from different organizations and especially with those you read about every time a new Baseball America is published. Also it is really cool to be wearing the official uniform of the Chicago White Sox. hopefully after the saguaros win the AFL, Ill get to wear it at US Cellular Field some day. Hello everyone! I hope this letter finds everyone safe and well. So, as many of you don’t know, I am a big fan of Seinfeld. For any of you that have not seen some episodes, it’s a show about nothing. So in the spirit of Seinfeld, this blog will be about nothing but encompass everything. I also received a question about Jordan Danks. Danksy has become a very good friend of mine since we both began Minor League Baseball. This guy is a very humble and nice guy and I am proud to call him my teammate and friend. Talk about an athlete. This guy is 6’6 and runs like a deer. It takes him about three strides to get to first base. I think Chicago will really enjoy watching him play one day, as I am sure he will make it to the big leagues sooner than later. Don’t try to get in a movie quote war with the guy either, he dominates. My roommate out here is Brett Wallace. Wally World, as I call him, is one heck of a baseball player. I nicknamed him Wally World because of the obvious reason, Clark W. Griswald. In the first of his famous Vacation movies, he takes a cross country trip to Wally World, a theme park on the west coast I believe. But it was closed and he then proceeds to hold a security officer at gunpoint to experience all the rides. ANYWAYS, Wally has been playing excellent baseball and should be playing in the big leagues very soon. So recently I have been swinging the bat pretty well. To take a quote from Will Ferrell in Old School, “What happened…I blacked out.” I am very happy to be finishing the AFL season on a high note. It’s always nice to finish a season on top so you have a little momentum going into spring training. 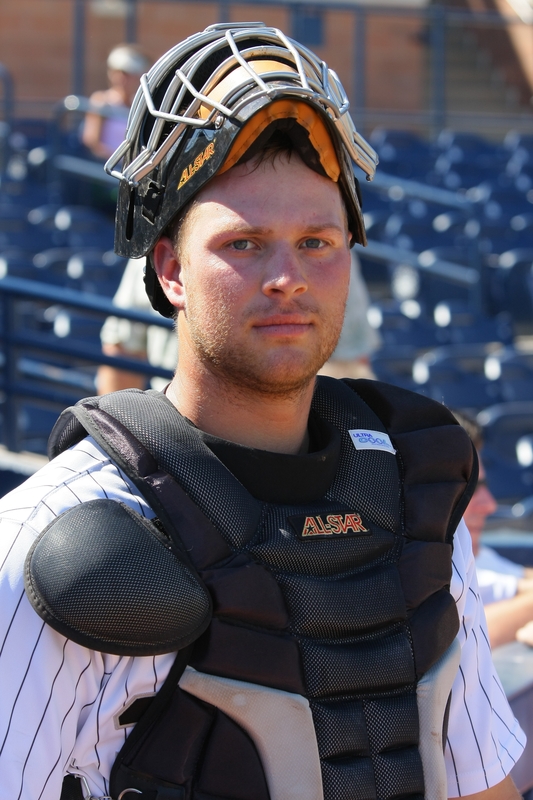 Hi everyone my name is Cole Armstrong and I am a 25 year old catcher in the Chicago White Sox organization. I split this past year between Double A Birmingham and Triple A Charlotte. I was born and raised just outside of Vancouver, British Columbia….Yes Canada. While most of the kids I grew up with dreamt of suiting up for the canucks or some other NHL team my love was always baseball. (Although I do religiously follow the Canucks.) I was drafted by the Mets in 2001 but elected to attend the U.of Kansas. After a year as a Jayhawk I transferred to Chipola Junior College in Florida. Following that 2003 season I was drafted in the 16th round by the Braves, and signed my first proffesional contract. After three seasons spent in the lower levels of the braves sysetem I found myself coming off of a subpar year in Low class A. To make things worse I had Brian Mcann, Jarrod Saltalamacchia and Clint Sammons ahead of me in a catching thick braves minor league system. That winter I caught a break when the White Sox claimed me in the minor league portion of the Rule Five Draft. I have spent the past three seasons working my way up the ladder and as I said earlier finished this year in Triple A. Upon being told I would be playing in the AFL I was ecstatic. Just thinking of how many great players spent a fall in this league made me realize how close I was to my ultimate goal of being a major league player. Aside from being thrilled that Im enjoying 95 degree weather in October I have had a blast playing with the Saguaros. Our team immediatly gelled this fall getting off to an 8-0 start. While we have run into a few losses sice then we have stayed atop our division standings. As Im sure youve read in other blogs by Saguaros players the chemistry on ths team is increadible. Its like being on a team that has played together for years, we seem to have a never say die attitude that is infectious through our dugout. I attribute alot of our success to our coaching staff who have worked tirelessly with all of us. They are by far the first ones in the clubhouse and the last to leave. One experience I have really enjoyed out here is interacting with players from other organizations. It is amazing to see the similarities and differences between us as we all reach for the same goal. The only complaint I have to this point is the lack of hockey coverage out here, however I did make it to a coyotes game so that should suffice for a few weeks. Hopefully “The Cacti” as we have come to call ourselves continue to roll all the way to an AFL championship. Go Cacti! Hello everyone! Another week has passed and my how they seem to fly by. Thank you to all of the responses that I received last week. I really appreciate people taking time out of their day to write such nice notes. To the Matheson’s, I would have called but I lost my phone so I don’t have your number! So would you please make my phone ring so I have your number once again. This past week has been a little less eventful than the week before. I played in the rising stars game this past Friday. I was selected along with everyone else by various scouts and GM’s from around the league. It was obviously a great honor to be selected and I enjoyed every second of the game. It is fun to play with the best in the minors everyday, but it is another to play with the best of the best in one game. The game was actually the most intense game I have played in since the last game of the College World Series. We went into extra innings and ended up losing in the bottom of the tenth on a walk off walk. Talk about a way to end a game. Probably more importantly than baseball, my mom and sister flew in today. Gwen, my sister, is actually missing the Georgia-Florida game this weekend to come see me which is a big deal for any Georgia fan. The Georgia-Florida game is the biggest game of the year for the Dawgs and the Gators. And my little sis decided to skip it to come see me so it means a lot. Mom is also taking some time out of her busy schedule to come see her baby boy. I keep telling her I am not a baby anymore, but apparently she doesn’t really care what I think. It is always nice to see them and even more so when I had not seen them in about a month and a half. They bombarded me with questions of course because they are women and that’s what women do. I tried to answer as patiently as I could but enough is enough. They will obviously be hitting up fashion square for the remainder of the weekend (sorry Dad), and they will catch a couple of games while they are here. But other than that, all is quiet on the western front. I look forward to writing you next week. Hello everyone! Once Again I am writing you from the Phoenix Arizona area, and what a week it has been. The temperature has cooled off as the summer starts to merge into fall. My team, the Peoria Saguaros, lost our first game two nights ago to the Surprise Rafters. It is pretty unbelievable that we have only suffered one loss in eight games with the competition as difficult as it is. I attribute the fast start and the excellent record to great team chemistry. This team has gelled faster than any team I have ever been on. We are all very close, thus making us care about how well our teammates do. So far I have not been playing everyday, which I am not accustomed to doing, but it is an excellent way to watch how older players handle themselves. I know I am a young player in the big scheme of things and while it is hard to sit more than I play, I know it will help me in the long run. I have to learn from watching others, which will in turn help me realize what I must do to be successful. Baseball is an incredibly difficult game. When in life are you considered to be great if you succeed three out of ten times? Baseball was meant for the strong willed and most understanding of people. You must learn to harness your mind before you can truly be successful. I often remember a quote from a movie “A League of Their Own”. Tom Hanks, who is a phenomenal actor states, “Baseball is something that gets inside you, it’s what lights you up. If it wasn’t hard, everyone would do it, the hard is what makes it great.” This quote reminds me that baseball is a special game, and not everyone can play it, so be proud of the place your at and enjoy it as much as possible. I really appreciate all the comments that were left for me by family, friends, and new acquaintances. As I’m sure you all know, my goal is to show you a little glimpse of my life in the fall league. And no, I was not an English major, but I know for sure that I will engage you with my words and feelings. I do not wish to write you a novel, because that might get boring and repetitive. My major was actually Real Estate, I appreciate you asking. The Terry College of Business at the University of Georgia is ranked in the top three business schools year in and year out in the entire country. The Real Estate department is considered to be the second best in the country as well. My father majored in English and got his masters degree in Business from the University of South Carolina. He has taught me to be articulate and thorough in all my letters and essays. And it is because of him I am the person I am today. I wish all of you well and look forward to writing again a week from today. Hello everyone! I hope that this message finds everyone reading it safe and sound. My name is Gordon Beckham and I was drafted by the Chicago White Sox in the recent June Draft. Signing in the middle of August left me only about half a month to get my feet wet in pro ball, it’s amazing how much you learn in such a short period of time. For the next month and a half, I will be representing the White Sox in the Arizona Fall League. So far, I have really enjoyed my teammates and the low-key attitude they seem to have. These guys have much more experience and always take things in stride. I look forward to watching the older guys to see how they handle themselves on and off the field. It will be a privilege to play with these guys day in and day out. Looking back, I had three unbelievable years at the University of Georgia. My time spent there was some of the best moments of my life so far. I am very proud to say I am a Georgia Bulldog. I am also supported by an incredible family who has always been there for me. My dad (Gordon) and mom (Sully) have stuck with me through thick and thin and I have always appreciated their unwavering encouragement and support. My two sisters, Gwen (19) and Grace (16), have always seemed to keep me grounded and I am very proud of the way they handle themselves all the time. I’m just glad they don’t make me have to be a very protective older brother. Enough about me, I look forward to my next post a week from today.